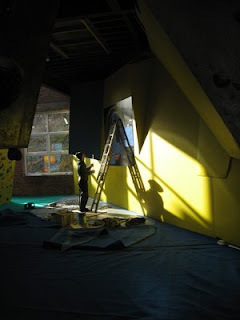 Tonight sees Round 3 of the the Berghaus Bouldering League. As usual it starts at 7pm and finsihes at 10pm. Scorecards cost Â£2 plus your usual entrance fee. Tonight we have a special £100 cash prize but to get it you have to climb 2 problems, both of which start in the same place. Its another mad volume journey... x 2. Check out the picture of Sam starting the problem(s). Also today we've had Al Williams in re-doing the logo of the Clinic on the back wall. This should be done by tonight and reset on Monday. The other new wall is being reset today. Finally, our front desk computer has finally gone 'bang!' For 2 and a bit years it has done a great job but the final straw that broke the camels back was a cup of tea from a certain member of staff that will remain nameless. Katy. 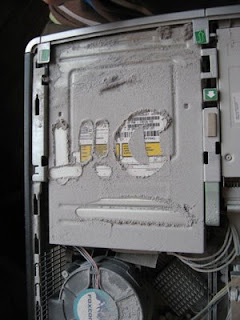 As you can see below, how the computer lasted this long is a surprise considering the amount of dust in it.